MILWAUKEE – (September 25, 2018) – Johnson Controls has announced the addition of a bullet form factor to Tyco’s Illustra Flex 4K camera line. The latest model provides increased detail and efficient bandwidth management technology. 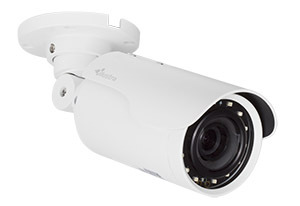 Featuring a tough enclosure, the Flex Bullet camera is ideal for exterior applications of small to medium size offices, retail boutiques, schools, and small bank branches looking for a rugged camera that can withstand harsh environments. With a sleek IP68-rated housing to protect against dust and water damage, this camera is perfect for parking lots and garages, loading docks, and any exterior entrances where it is exposed to the elements. Illustra® IntelliZip provides powerful bandwidth management beyond H.264 and H.265, reducing network bandwidth and video storage requirements. This embedded technology continuously monitors and optimizes system streaming parameters to match the level of activity within the camera’s field of view, offsetting the added video storage required when streaming at 4K resolution. The Flex 4K Bullet adheres to the rigorous security standards of the Tyco Cyber Protection Product Security Program. The holistic cyber approach begins at initial design concept, continues through product development, and is supported through deployment.